Master “Iron” Kim’s goal was to teach the Oom Yung / Chung Moo line to people of all nations. To do so, he planned to build a strong foundation of martial arts in the United States from which to spread worldwide. With this goal, Master “Iron” Kim left the Orient and came to the United States in the early 1970’s. In 1970, Master “Iron” Kim demonstrated Kyong Gong Sul Bope by jumping from the equivalent of an 11-story building. In 1972, shortly after arriving in the United States, Master “Iron” Kim again demonstrated the Kyong Gong Sul Bope movement by jumping from the equivalent of an 8-story building and landing without injury on a sloped surface below. Very few individuals have ever accomplished such feats. During the “Billy Jack” movie promotion in California, Grandmaster demonstrates a sword form. Upon arriving in the United States, Master “Iron” Kim felt he could best begin to teach martial arts by first learning basic English and American culture. In 1973, after educating himself about the American way of life, Master “Iron” Kim opened the first of four schools that he owned in the United States. Many times in areas where schools became established, the local paper would interview Master “Iron” Kim, and write articles about him and the Oom Yung /Chung Moo style of martial arts. In early 1974, Master “Iron” Kim briefly returned to Korea. It was at this time that Wang Po, the 7th generation Grandmaster of Yin Yang Doe, passed to Master “Iron” Kim all the knowledge and traditions that had, likewise, been passed to him. Soon thereafter, the title of 8th generation Master of the Oom Yung line was bestowed upon Master “Iron” Kim. Grandmaster Wang Po passed away in 1976 in Pusan at the age of 93. At the Billy Jack movie promotion, Grandmaster “Iron” Kim uses 1/2 ton of force within 1/4 inch to break a brick on student’s head without injury. It was also in 1974 that Master “Iron” Kim was the principal martial arts demonstrator for the second “Billy Jack” movie promotional titled “The Trial of Billy Jack.” In this exhibition, Master “Iron” Kim performed in front of approximately 125 martial arts masters and experts from around the world, and over one hundred actors and actresses. In 1975, about a year after the untimely death of martial arts actor Bruce Lee, Warner Brothers motion picture studios began their search for a replacement. After auditioning martial arts “experts” from around the world, Master “Iron” Kim was asked to screen test and was subsequently pronounced Warner Brothers’ selection. At that time, Master “Iron” Kim was faced with the choice of accepting a motion picture contract or continuing to teach his art. Master “Iron” Kim chose to continue sharing his knowledge, which has proven to benefit many thousands of recipients of his training. In 1975, Master “Iron” Kim was also the principal demonstrator for the International Martial Arts Exhibition benefiting the “Asian Orphans Charity.” Over thirty masters and experts assisted Master “Iron” Kim in this worthy cause. The proceeds from this charitable event provided aid to children of all nationalities. 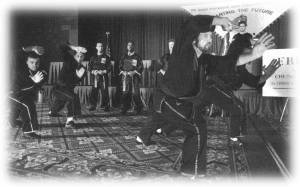 In 1976, Master “Iron” Kim taught U. S. military martial arts instructors from around the United States. These training sessions were conducted at Master Kim’s training center near Ft. Jackson, South Carolina. Demonstration of “double doe” (two swords) at the National Championship Tournament. From 1977 through 1982, Master “Iron” Kim devoted his energies to training a select group of black belt students who had previously demonstrated both outstanding abilities coupled with the mental or “chung” discipline that Master Kim requires of all advanced students. Beginning in 1983 and continuing through 1989, Master “Iron” Kim concentrated on training select 3rd degree through 8th degree Instructors and Masters. 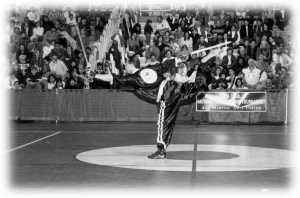 In 1989, for the first time, Master “Iron” Kim founded “Chung Moo Doe” to represent the heritage of the royal line of martial arts for the first generation of practitioners in the United States. By so doing, Master “Iron” Kim then carried on the title of Chong Su Nim (Honorable Founder). Proper execution of Byung Ja demonstrated for the FBI. The annual “Eight Martial Arts National Championship Tournament” began in the 1990s and has been held under the name of Chong Su Nim (Honorable Founder) “Iron” Kim, whose great skills are recognized internationally. This event is held for both students and instructors, with medals, trophies and certificates awarded at the competition’s end. (see Tournament description, page 92). Throughout the 90s, members of Chong Su Nim “Iron” Kim’s style presented honorary martial arts certificates to United States Senators and Congressmen, as well as numerous judges, government officials, police and military officers, television anchors, clergy and community leaders. These individuals have all recognized the vital role that Chong Su Nim “Iron” Kim’s teachings have played in inspiring hundreds of thousands of people throughout the years. Chong Su Nim “Iron” Kim trained the instructors who demonstrated the proper use of weapons and “empty hand” combat to members of the FBI during the 17th Annual International Asian Organized Crime Conference held in 1995. In 1996, Chong Su Nim “Iron” Kim formally became Grandmaster “Iron” Kim of eight different martial arts disciplines and retired. Unlike the average retiree who turns his thoughts and life in a new direction, Grandmaster “Iron” Kim has intensely undertaken the study of bettering the physical and mental abilities of all age groups, with special emphasis on the aging. In 1999, Grandmaster “Iron” Kim chose to use the name “Oom Yung Doe” to represent all the knowledge that is being passed down to the schools, the community and throughout the world. Throughout history, only a very small number have earned the status of Grandmaster of true Moo Doe. 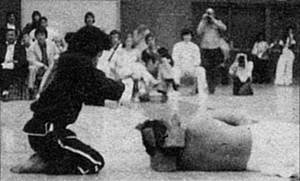 Before he came to the U.S. in 1972, Grandmaster “Iron” Kim had achieved the highest level of skill possible within the eight different Martial Arts (Moo Doe). To our knowledge and belief, he is still, today, one of the very few people who can substantially demonstrate miraculous mental and physical Moo Doe strength. Grandmaster “Iron” Kim is considered to be one of the most powerful Moo Doe (Martial Arts) practitioners in the world.